152 mm/50 Mk86 х 1 pcs. 76.2 mm/50 Mk102 х 1 pcs. 152 mm/53 Mk1410 х 1 pcs. 12.7 mm Browning M2 mod. 14 х 1 pcs. Phoenix — American Tier IV cruiser. A scout cruiser design whose distinctive features were very high speeds and a torpedo armament. In contrast to most cruisers of her time, the cruiser's artillery was placed in open mounts. Phoenix never materialized, but served as a prototype for development of the Omaha-class cruisers. A very fast cruiser with top speed of 35 knots (as fast as some destroyers), coupled with a rudder shift time of 5.4 makes Phoenix a very maneuverable ship. The long range guns (15.27 km upgraded) are great for setting fires on enemy ships, especially battleships (which are a favorite target of the Phoenix). Meanwhile, use the high maneuverability of the Phoenix to avoid showing the broadside because a battleship can severely punish her. It is best to stay close to allies and support and protect battleships by scaring off destroyers and cruisers. Keep in mind that the Phoenix has a weak AA suite, so it cannot protect allies against aircraft. Phoenix can surprise enemies that come from behind an island with the 5.5 km range torpedoes, sometimes they can be used duel with battleships. That may cost your own life if that battleship has time to fire a salvo of AP on your broadside, though. Poor survivability - very thinly armored and prone to rudder and engine incapacitations, coupled with her very low hit points for a Tier IV cruiser. Due to Phoenix’s low number of main armaments and fragility, it is highly recommended to research to the (C) Hull as quickly as possible to gain access to more armaments and the Hydroacoustic Search ( ) consumable. Slot 1: Main Armaments Modification 1 ( ) - lowers chance of destroyed armament and faster repair. Useful because the enemy can easily destroy armament. Slot 2: Steering Gears Modification 1 ( ) - comes in handy to prevent steering gears being incapacitated and faster repair. Use together with captain skill Last Stand. This will help prevent you giving broadsides to enemy ships and better odds of avoiding torpedoes. Phoenix torpedoes devastate an enemy Wakatake. The Phoenix is based off of a 1917 scout cruiser proposal that was planned as the successor to the Chester class. They were designed to be fast, have good seaworthiness, and a top of the line observation and communication suite in order to serve as the "eyes" of battleship fleets. They were up-gunned and up-armored later in the project's development so that they could fill a destroyer pack leader role. Their comparatively high cost, as much as four destroyers, resulted in Congress flat out refusing to allocate money for their construction as they feared that they would become obsolete before construction would finish. Experience gained during the First World War proved the viability of a scout cruiser design and resulted in the plans being radically redesigned into the Omaha class. 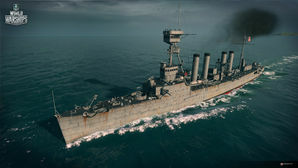 The project was given the name "Phoenix" (after the capital of Arizona) by Wargaming in accordance with the American tradition to name cruisers after cities. Actual name is Scout-1917 Program. Phoenix is actually the name of a Brooklyn-class cruiser, hull number CL-46. Being a paper design, both hull upgrades are fictitious modernizations. The fictional 'C' hull has two quad 1.1-inch (28 mm) AA guns. The weapon began production in 1938 and was equipped on cruisers in 1941, which suggests that the ship is in 1941 condition. The real Phoenix was commissioned in 1938 and remained in USN service until 1946, as such it is highly unlikely that the paper design would have also carried the same name. The drawing the Phoenix is based on. This page was last modified on 8 September 2018, at 01:18. This page has been accessed 40,019 times.